Director(s): Jack Johnson, Donte Williams. Cast: Black Jack Johnson, Jay Davis, Will Cummings, Harold Dennis, Brian “Da Wildcat” Smith, David Perry, and Calvin Evans. Story: Franklin and Mike find themselves trapped in the undead-infested Cyrene City, where they must attempt to lead a group of unconventional survivors to safety. As they join forces with the likes of a pregnant woman, a moronic arms dealer, and a mentally challenged man, they will have to determine which is worse: relying on each other or succumbing to the zombie mayhem. While this uprising of zombies has overwhelmed the city, Mr. Roberts, the CEO of R2 Pharmaceuticals, has sent in a team of mercenaries known as the S.I.E.G.E into Cyrene City to recover the only known antidote for his own financial gain. 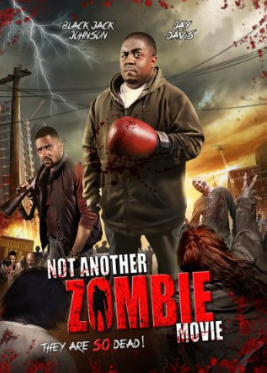 Not Another Zombie Movie… About the Living Dead is a hilarious twisted tale about survival versus morality during a zombie apocalypse. Watch as these survivors discover there is no such thing as a hero when zombies are trying to eat your face off. Source: nazm2015, official site. This entry was posted in Upcoming Films by blackcinemaconnection. Bookmark the permalink.